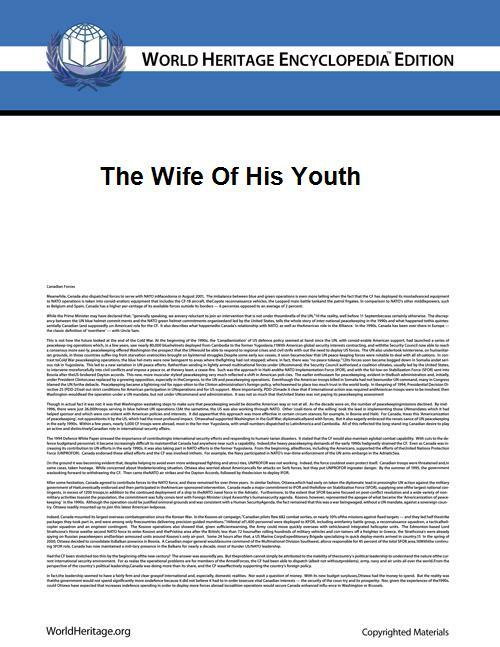 "The Wife of His Youth" is the title story of Charles W. Chesnutt's short story collection, The Wife of His Youth and Other Stories of the Color-Line, first published in 1899, the same year Chesnutt published his short story collection, The Conjure Woman. William Dean Howells reviewed The Wife of His Youth in The Atlantic Monthly. "The Wife of His Youth" follows Mr. Ryder, a biracial man who was born free. Mr. Ryder heads the "Blue Veins Society", a social organization for colored people that generally consisted of those who were more white than black. The society's name stemmed from the joke that you'd have to be so white your veins could show through. Mr. Ryder is quite sought after by the town's women, but begins courting a very white mulatto woman named Molly Dixon, from Washington. He plans to propose to her at the next Blue Vein ball during his speech, but is met beforehand by an old, plain looking black woman. Her name is Liza Jane, and she is in search of her husband Sam Taylor, whom she has not seen in 25 years. She says she was married to Sam before the Civil War, when they were slaves. Mr. Ryder tries to tell her that Sam could be dead, may have outgrown her, or could have remarried. However, she persists that her husband has remained faithful and refuses to stop looking, despite Mr. Ryder's advising her that slave marriages didn't count after the war. She shows him an old picture of Sam and then leaves. At the ball Mr. Ryder addresses the members and tells them the story of what the woman had told him; at the conclusion of the story, he asks the attendees whether or not they think the man should acknowledge his wife. Everybody urges yes. Then he brings out Liza and says, "Ladies and gentlemen, this is the woman, and I am the man, whose story I have told you. Permit me to introduce to you the wife of my youth."